With so much action on the football transfer front, football betting sites are having a field day offering odds on potential transfers as we gear up for a sizzling summer of sport. One of the most talked about transfer is that of Joe Hart, who is on his way to West Ham from Manchester City at the start of the season. The England international, who recently passed his medicals, is all set to move to London Stadium on a season-long loan with the option to buy pending further negotiations. The Manchester City goalkeeper would have preferred to join the club permanently, but after long consideration decided that staying in the Premier League would be the better option in the World Cup year. Hart is no stranger to season-long loan spells as he spent most of the last season in Serie A with Torino after City manager Pep Guardiola claimed that he was no longer the number 1 choice at the club following the arrival of Chilean footballer Claudio Bravo. The agreement to join West Ham follows Pep’s side willing to subsidise the player’s wages for the duration of the season. The deal is said to consist of City paying half of Hart’s £100 000-per-week wages with an option to buy at the end of the loan period. Guardiola has since signed Brazilian goalkeeper Ederson from Benfica for £34.7 million. The player’s Man City commitment only comes to an end in 2019, although he is eager to maintain his stance as England’s top footballer for the World Cup 2018 finals set to take place in Russia. Hart is the current record holder of attaining four Premier League Golden Glove awards, as opposed to others within his category. He also boasts an outstanding 71 international appearances since an early start in 2008. The player joined Manchester City in 2006 after a recommendation from coach Tim Flowers, who believed he had great potential, for a reported fee of £600 000, although the amount was confirmed to be £100 000 by then City chairman John Wardle. Subsequent to this, Hart joined the club as an official team member on 14 October 2006. He was named Manchester City’s top player by former club manager Sven Goran Eriksson and thereafter titled as one of the best goalkeepers with the shot at ranking among England’s greats in the long run. Of the choice to move, Hart said that it will be the next step in his career and a personal challenge. 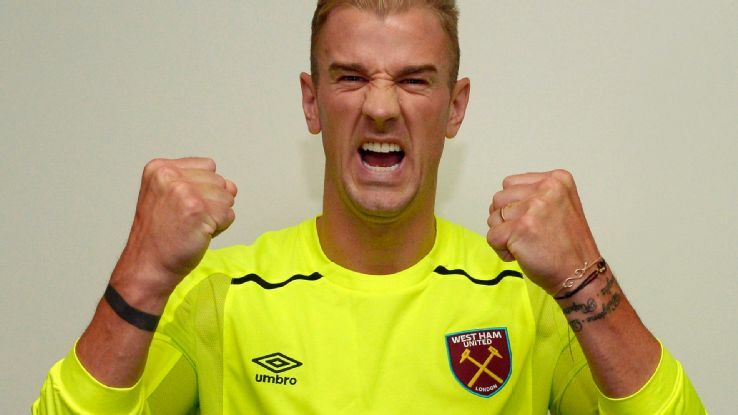 According to Captain Mark Noble, Hart has been ‘hard done by’ and backs the footballer’s move to West Ham to revive his standing as a top goalkeeper. Current West Ham goalkeepers Darren Randolph and Adrian are both said to be on their way out this summer as neither impressed boss Slaven Bilic last season. The club is also in negotiations to sign Stoke City’s Marko Arnautovic for a total of £24 million. The club’s first two bids for Arnautovic were rejected, but Stoke City reluctantly changed their mind, as the player seemed determined to leave. City, meanwhile, has let go of winger Nolito, who contracted into a three-year deal with La Liga club Sevilla for a fee of around £7.9 million. The club is also close to signing Monaco left-back Benjamin Mendy, while forward Clinton Njie, who failed to start a Premier League match, will join Marseille on a permanent deal from Tottenham. West Ham is currently at their pre-season training camp in Austria in preparation for the new season, which kicks off on 13 August 2017 with a game against Manchester United at Old Trafford. Before that, West Ham will meet City for a pre-season friendly on Friday, 4 August in Reykjavik.